I’ve always said that the mark of a great game is a novel, interesting theme that is completely integral with gameplay. This does not imply that the only great games are those where Space Marines or Valkyrie engage in mortal combat with deadly alien scum, it just means that a game that explores a compelling subject matter and allows you to engage in an activity you otherwise would not be able to in a fun and interesting way has a better shot than most of being a winner. Enter Five Fingered Severance, from Minion Games, a game that allows you to stick it to your corporate masters once and for all, and I’m here to tell you that the game has all the earmarks of greatness. In fact, it is one of the most enjoyable games I’ve played this year. The game has players acting out their last day on the job at a convenience store, which would be totally boring if the object was to be the best, most faithful employee. Luckily, it’s not. It’s about stealing everything that’s not nailed down, slacking off as much as possible without getting caught, and finally, about screwing over each and every last co-worker so that their similar efforts are stymied at every turn. This is a game of stealthily dodging the boss, stashing your stolen stuff in your locker, and above all else, making sure that your opponents are getting busted as often as you can manage to facilitate it. I can say, after four plays, that I absolutely love this game, and it will remain in my possession until the place burns down or I’m robbed. It’s that fun. Regarding the components, the only complaint that I have is that the box is utterly unappealing. It almost looks like it was designed by a high school student on an Apple 2E using a stock color scheme, and to add insult to injury, that color scheme is truly bland. If I saw it at a game store, I would likely not buy it just based on the box presentation itself, which would be a crying shame. That being said, everything else is quite decent and very endearing in a cartoonish sort of way. 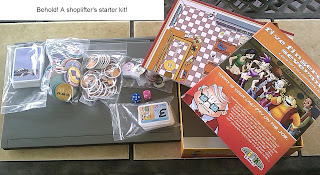 Inside of the box is one pink and one blue D6 die, a medium sized game board, a pack of standard-sized cards which are used to plot against people, about a bazillion half-sized cards which act as activities to partake in as well as a game timer, a bunch of cardstock standies with bases, and three letter-sized cardstock sheets worth of tokens that represent various things, the most critical being things that you can steal. 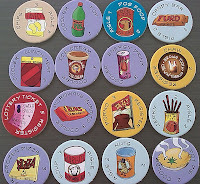 Speaking of the tokens, there’s a wide variety of items depicted, many are very funny, and the items make sense for the location they start in. For instance, the Brown Tooth Chewin’ Tobacco is at the register, complete with a depiction of a nasty, brown, bloody tooth. The Hot Dog item at the fountain looks all shrivelled and nasty and has flies circling it. In the cooler is a “The Runs Brand Microwave Burrito”. Can’t forget the “Get Layed” brand Potato chips or the “Monkey Spank” brand ice cream. All in all, there’s a ton of them, and while some are fairly pedestrian, the majority are funny in one way or another. Finally, also the rulebook, which is quite easy to read not only because it’s well written and well organized, but because it’s quite funny. All the components are of really good quality, thick and durable cards, and the die cut cardstock bits punch easily and cleanly, leaving no hanging chads or ripped up edges. All in all, it’s a very well made game that will last a good while. Setup is very simple, but a hair on the time consuming side if you haven’t bagged everything up. First, lay the board out and then shuffle and place all the half-sized cards, called “work markers” in the game, on their space on the board. 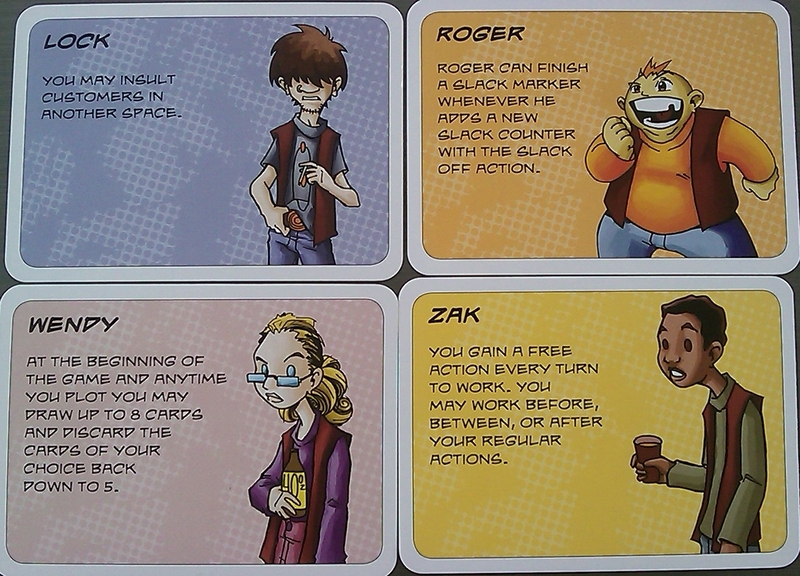 Next, randomly select a character to play and take the player card as well as the standie, and then put the boss standie in the office location. 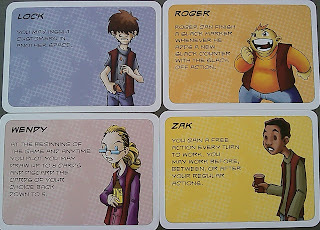 Next, shuffle the large cards, called “plot cards”, and give each player five of them. Next, stack each color-coded item token face-down and place the stacks in the color-coded circles on the board so that they can be pilfered later. Finally, draw six of the work marker cards and resolve them by either performing the action listed or placing them where they are supposed to be placed as indicated. Once all of that is done, you’re ready to place your standies in the location of your choice. 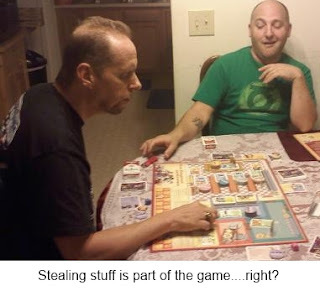 Gameplay is very simple in theory, with each player, in turn, drawing and resolving a work marker and then taking two actions on their turn, in addition to playing any plots they desire to for free. 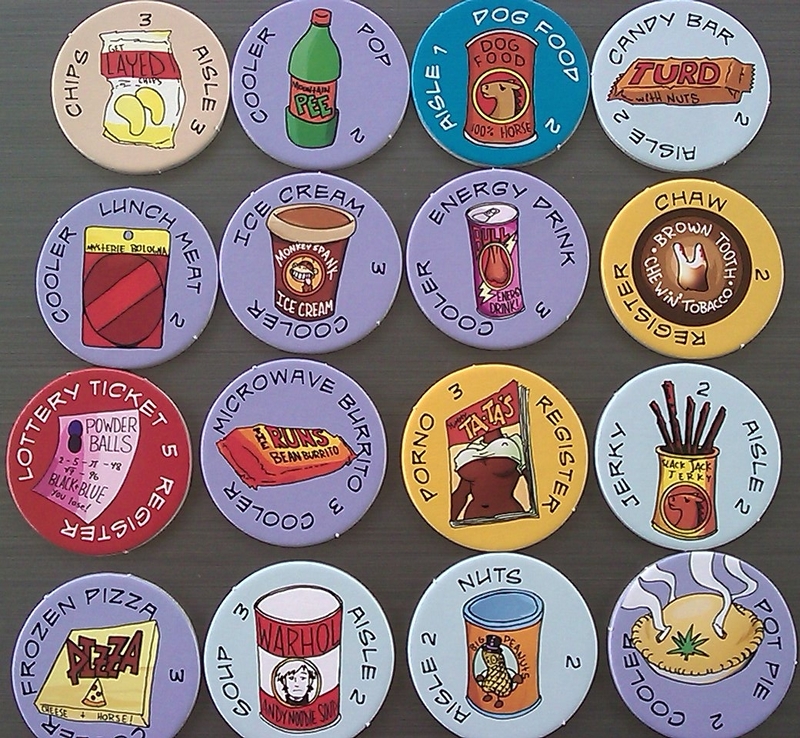 The work markers are the narrative aspect of the game, and the work involved is only very rarely actual work, with a great many of cards representing various ways to slack off such as “nozzling” at the drinking fountain, playing video games, taking an unscheduled smoke break, engaging in a fire extinguisher fight, or the most disturbing, making out with an old lady who looks like a worn-out truck stop lot lizard. Many other cards represent customers entering the store, and these give you the option of insulting them which scores you points but cause you to take heat from the boss, or help them, which reduces the heat you’re taking from the boss. Some work markers are events, and these cause the boss to move, generally. The “bad nachos” card, for instance, has the boss sprint to the bathroom in order to transform into a soft-serve dispenser, where he’ll stay for an entire round, groaning and evacuating his bowel. Others cause the boss to move to key locations, such as the office or the cash register, and these two locations generally end up having the choicest goods; the register has them because that’s where the good stuff is, and the office has them because if someone’s had a Jane’s Addiction moment, the items get put in the office for safe keeping. The entire game is made up of taking actions which include resolving work markers, as noted above, to reduce your heat with the boss, and these include mopping up the utterly vile looking bathroom, stocking an aisle, and other menial tasks. These are only useful when you’re catching major heat and are getting close to being fired, because once your heat level reaches 30, your game immediately ends. Most of the actions are straightforward, such as moving your pawn to another location, calling the boss over to your location, or tattling on another player when the boss is in your location, which allows you to move the boss to any other position on the board. The boss is truly the “x-factor” in the game, because you cannot steal things, slack off, or insult customers when he’s in your space, and if you’re copping some stolen merchandise when he’s in your space, irrespective of how or when he gets to you, you must make a suspicion roll. The saving grace regarding the boss is that the boss can only move once per turn, so if he’s moved on your turn due to an event card, your own action, or a plot, you know he can’t be moved again, freeing you to rob the place dry or tell off the customers. Suspicion rolls are the main deterrent to theft and slacking off, because if you get caught, you are completely screwed. You lose everything that you’ve stolen but haven’t stashed, and for each item you’ve stolen you take some heat. Some items, such as a handgun, lottery tickets, and stolen money from the register cost you more heat if you’re caught, but they’re definitely worth stealing because they’re the most valuable items in the game. The mechanic is such that for each uncompleted task on the location you’re currently in when you get waylaid by the boss, you add one to the total you need to roll above, and for each item you have secreted in your jacket you add another point. Again, the choice items from the register are more valuable, and thus add two to the suspicion roll rather than the normal one. If you pass the check by rolling above the total, you’ve eluded the boss’s ire. If you’re caught, though, all your stolen items go to the office and you catch the heat. Now stealing items isn’t all that easy, either, especially late in the game when lots of customers are strolling the aisles. With two exceptions, if a customer is in a location that you’d like to steal from, you can’t. Add to that the fact that you can’t steal when the boss is near, and it forces you to deal with the customers, either positively or negatively, to get them out of your face so you can grab the goods. 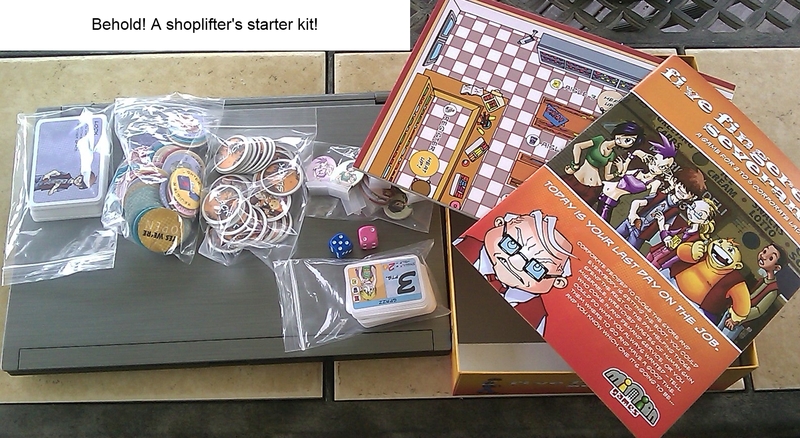 Once you’ve got stolen items, you place them face up on your player card, and to bank them, you need to head to the storeroom and spend an action to stash them, which allows you to turn the items you’ve gotten face-down on your card and redeem them for points at the end of the game. Another way to make some points, as I noted, is to mess with customers. 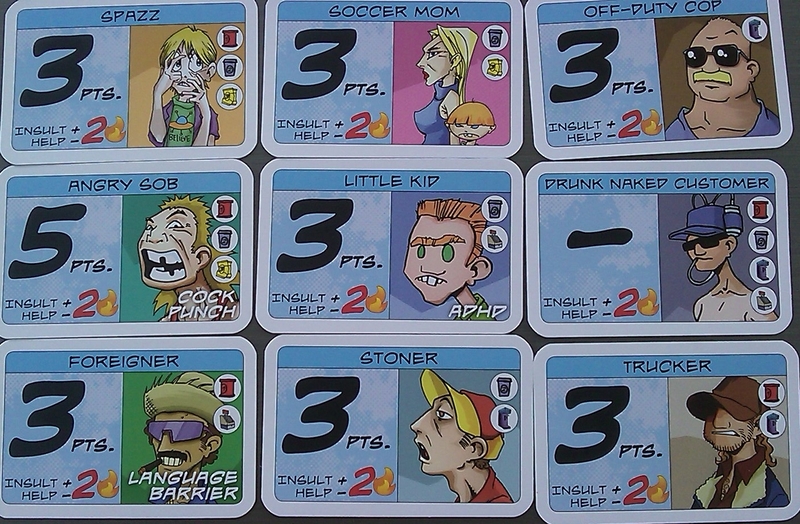 While many customers have no special traits and are the typical fare you’d find at a convenience store, such as a soccer mom, a stoner, or a drunken, naked customer, some have special powers that affect the game. 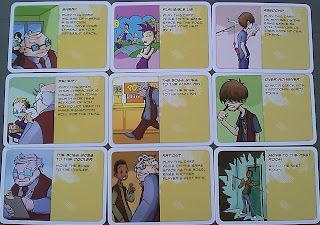 The ADHD kid moves around the store every time a new customer enters, the punk convenience rats will grant you free cards as they plot against “the man” with you, and my favorite, the Angry S.O.B., will “cockpunch” you if you insult him, thus forcing you to lose your next turn. Yes, the card says “cockpunch” right on it. 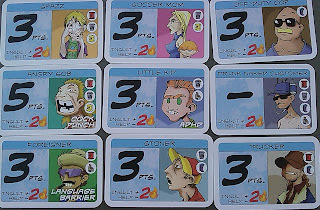 Anyhow, you are limited in what you can do when a customer’s around, and when their work marker is drawn, the player who took the card may place them in the location of their choice based upon the icons on the card itself. Again, you can always help them to reduce the heat on you, but you don’t get any points if you do so. As an unofficial variant, we’ve chosen that you must actually come up with an insult for the given customer to complete the action, and that adds some serious spice to the game. Telling the ADHD kid that the best part of him is still stuck to his mom’s fleabag mattress just seems to add something somehow. Besides stealing and insulting customers, the final way to score points is to slack off. When you’re in a location that has a slacking off work marker, you can choose, as an action, to slack off for points. This is the only mechanic in the game that is persistent from turn to turn, and when you choose the action, you place a slacking off token on the work marker under your pawn. As an action you can end your slacking off and bank the points, or you can continue slacking up to five times. Once you’ve gotten the maximum of five tokens on the marker, you can’t slack off anymore and have to close out the action to bank the points. Some slacking markers are listed with a multiplier, so when you bank them, they double in value and you can bank twice the slack tokens. The downside of slacking is that if the boss comes by when you’re slacking off, you have to make a suspicion roll, and the markers have a suspicion value listed that generally starts at two points, making them risky. Add to that the fact that you have to add the suspicion value of all the stolen items you have in hand, and it makes for a very risky proposition as all of your opponents will be just dying to get the boss over to you in order to screw you over. 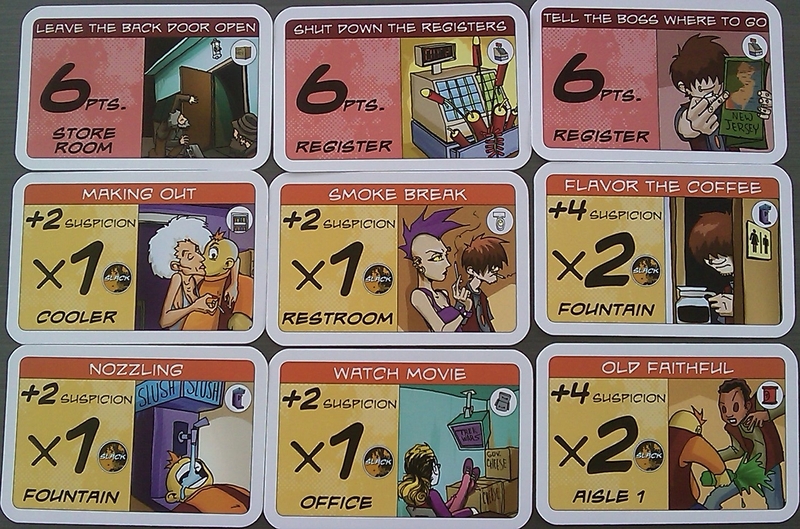 The final, and arguably most devilish, strategic aspect of the game are the plot cards. 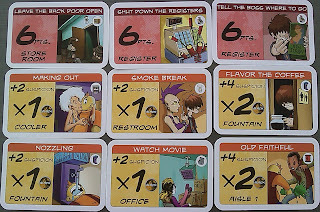 These cards allow you to do all kinds of things that range from instantly nailing the opponent of your choice with three heat points or allowing you to move your figure to the Storeroom for free all the way through sending the boss to a location or being allowed to respond to a suspicion roll by sneaking off to another location. At any time on your turn you can, for an action, discard as many plots as you want and draw more, or simply draw up to your maximum if you’re running low. Plot cards can be played, for free, at any point in your turn and two specific ones can be played in response to being hosed by an opponent. As I noted, there’s player elimination in the game due to getting too much heat, but there’s another method as well, which are the red work markers. These events are the pinnacle of being a malicious employee, and range from leaving the back door open to telling the boss what he can do with that tube of Preparation H in aisle 3. These are worth six points, but instantly cause you to be fired and thus eliminated from the game. The game ends on its own when the last work marker card has been drawn from the pile, with the player who drew it not even getting to play out that last turn. Players tally their stashed items’ values, their slack tokens, and finally, half the amount of their heat points remaining when the game ends. The winner’s the one who has the highest score, and although the game makes no reference to resolving ties, we’ve run into this and decided that the player who stole the most individual items is the winner, in the spirit of the game’s name. The short version is that this game is loaded with player interaction, and it actually scales really well from two to six players. The two player game isn’t as satisfying because you will invariably be trading blows with only each other, but when played with three or more it is an outstanding game. I was shocked with how much not only I enjoyed it, but how much every single person who I’ve played it with has. This game is absolutely in the pole position for my favorite game of the year thus far, and with Battleship Galaxies and Conquest of Nerath being contenders for that spot, this was the stealth candidate that I never saw coming. If you like Cosmic Encounter, then you will love this game. There’s some randomness to it, but virtually every decision you make in the game will affect the outcome, for better or worse. One of the best characteristics of the game is that not only are the turns quite short, the game breezes along at a wonderful pace, even with six players, and ends in right around an hour or an hour and a half. It truly hits that rarely seen perfect balance between being too long and drawn out and being too short, wishing you had ten more turns. I simply cannot recommend this game any more highly, and I’m glad I took the time at GenCon to eyeball it, otherwise I may never have heard about it, which would’ve been a total shame. What Caused Me To Become The Cockpunching, Angry S.O.B. – It’s a bit on the expensive side at an MSRP of $44.95, but you can always steal it, right? This game is simply one of the best games I’ve played in the last year, and with its cartoonish art, its irreverent theme, and its dorm room potty humor, it’s absolutely a blast. Don’t let the theme and art fool you, this is a very strategic came with cut-throat action throughout that would make Jack The Ripper blush. If you like games with player interaction and a mean streak, your collection simply will not be complete without it. I give almost all of my review copies away, but there’s not a chance in hell that any of you will get your hands on this copy by my hand. It’s just too good.